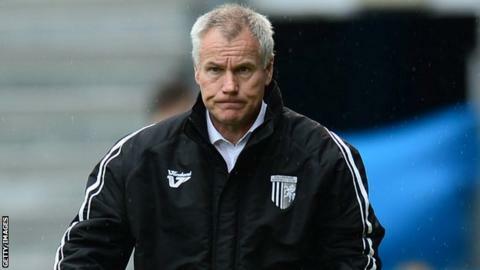 Gillingham manager Peter Taylor has urged caution as he believes his side are still a work in progress. The Gills have won four and lost three League One games since the 60-year-old took charge in mid-October. "The team are still learning and still progressing," he told BBC Radio Kent. "I still believe, long-term, if we keep doing the things we are trying to do we will be a better team for it. It doesn't mean it is going to happen straight away." He added: "There will still be ups and downs, good performances and bad performances and good results and bad results. "Overall, to get 12 points from seven matches, I certainly would have taken that the first day when I walked in the building." After initially taking charge at the Priestfield Stadium on an interim basis, Taylor was handed the reins until the end of the season earlier this month. The former England caretaker favours a passing game but, with the Kent club currently five points above the relegation zone, he says it will take time for his ideas to bed in with the squad. He has previously called for supporters to be more understanding of the side and has reiterated the need for realism. "The last thing you want to do at this particular time is have loan players to take over a new team when the season is 11 games old," he said. "You then haven't got time to practise too much as straight away you are into matches - and it is normally a Saturday match and a Tuesday match. "You can't work enough with the team. That is not ideal. "When I have had a pop at a supporter or two it is only for those reasons of being a little bit unrealistic, not for our performances. "Some of our performances have not been good enough. "I just want people to be a bit more realistic on the amount of time it takes and the amount of time we have had with the players."